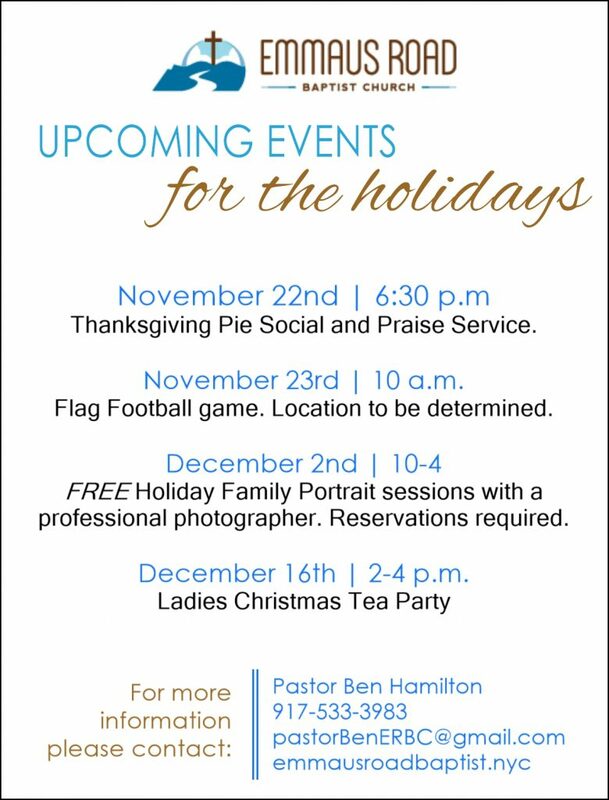 We are looking forward to some special holiday events! Please contact us if you have any questions or would like further details about any of the events listed below! Thanksgiving week offers two opportunities for fellowship. There is a pie social and praise service on Wednesday evening before Thanksgiving, and the guys will be playing a fun game of flag football on Thursday morning while the turkeys are cooking! We are especially excited to have a professional photographer coming in to offer free family holiday portraits on December 2nd. You will leave with a print in hand, and then we will deliver the digital copies to you on a CD. This event will require a reservation as the slots are limited, so contact us if you want to sign up! Ben, I shared these events through Facebook, Twitter, and LinkedIn. Hope it helps! Praising God for the work he has begun there in the Bronx. So thankful for your friendship and ministry. I’ve added your blog to my Inoreader.com RSS blogroll, too. Looking forward to catching your posts.